Recently I read about a restored garden called Painshill near Cobham, Surrey, England. What caught my attention was that its restoration includes a garden of American plants. Painshill dates to the eighteenth century, the time of the birth of England’s landscape garden, which distinguished itself as more natural rather than symmetrical and formal in design. The Honourable Charles Hamilton (1704-1786) created this garden between 1738 and 1773. He included all of the elements of the landscape garden of that time: lawn, vistas, a grotto, a lake, classic structures, and, of course, collections of the latest plants like American plant varieties. When Hamilton established the garden, there was a keen interest in cultivating American plants. In the eighteenth century John Bartram (1699-1777) sent seeds of American plants from Philadelphia to his English admirers, coveting American plant varieties. Hamilton was among that group. In May 2006 Painshill was awarded full collection status for its John Bartram Heritage Collection, by the National Council for the Conservation of Plants and Gardens. 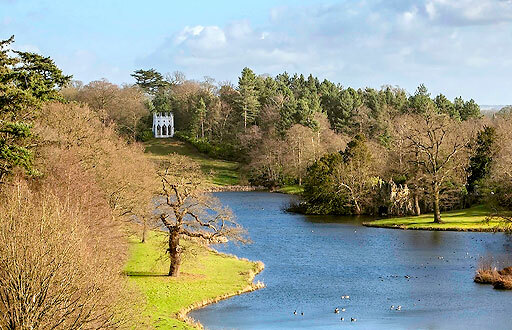 Today Painshill comprises 158 acres of the original more than 200 acres. What I find so interesting in this story is the idea that the eighteenth century English aristocracy wanted American plants. That in itself makes the Painshill restoration so important to me. Usually it is the other way around: we Americans want everything English in the garden. On a visit to Kew Gardens a few years ago I enjoyed seeing Tulip Poplars that had grown to a majestic height. At the time I was living in Virginia and there were many of them growing on our property situated at the foot of Purgatory Mountain.Having grown up in England these beautiful trees were new to me with their lovely pale green and orange flowers so high up in the sky. So it was a surprise to them flourishing there at Kew and several other Stately Homes. Caroline, thank you for responding to the post. There was a steady flow of our American trees, shrubs, and perennials to England, beginning in the 17th century, but that exporting really took off in the 18th century. Strange thing though was that once the English cultivated these plants, they became a bit more welcome in American gardens. We know that from seed and nursery catalog offerings. Unfortunaley, to this day American gardeners have a hard time with native plants since often their bloom, unlike exotic annuals, lasts only a couple of weeks.